The Wynne family of Tigroney, Co. Wicklow, was a branch of the Wynne family of Hazelwood, Co. Sligo. Their very successful mining concerns in Germany at the end of the nineteenth century were run by cousins Albert Augustus and Wyndham Henry Wynne. Eventually the cousins took over an estate at Glendalough and Albert became involved in mining in Wicklow. Albert married his cousin Alice Katherine Wynne and they had six children. 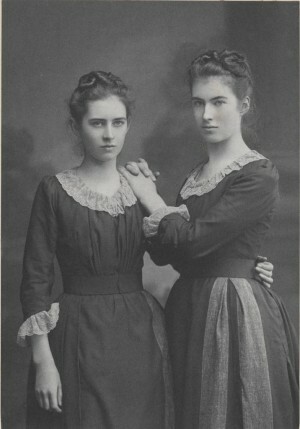 Two of the daughters, Winnifred and Veronica, worked in the Censor’s Office in London during the war. Emily Adelaide Wynne (b. 1871) trained in fabric design in Belfast in the early years of the twentieth century. She is represented in this project by a brief, unfinished ‘home-front’ diary she kept during the months August-September 1914.